Reason for Reading: Anna, of Diary of an Eccentric, mentioned to the author I might like the book and he sent me a copy. Thanks Anna! Johann Brenner, an idealistic physician and ardent German nationalist, has joined the Nazi Party and willingly participated in its "crimes against humanity." His Jewish childhood friend, Philipp Stein, has also become a doctor. Their lives inevitably intersect until their last, fateful meeting. After the war, Brenner, with stolen papers and a new name, has become a janitor in the courthouse where the Nuremberg Trials are being held. Hoping to "heal himself" and begin a new life with his estranged wife, he decides that he must write her a letter telling what he has done--and why. Over the years I have battled with myself over what my favourite reads of the year are come the end. This year, though, I have not had a hard time at all picking my favourites. I am not sure what it is, but I could rattle them off to you right now with no problems. They just stand very high above the rest this year. Shadows Rising by Douglas R. Skopp is one such book. I will start the review off by saying that I thought this book was fantastic and that everyone needs to read it. The problem with really good books is that I have a hard time doing the book justice. I think I put too much pressure on myself; so a lot of times I don't review them at all and then I regret it. This is me attempting to do justice to a book that will be on my best of list for the year. 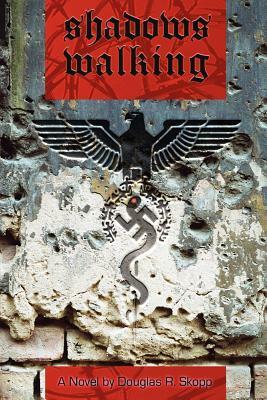 One of my favourite aspects of historical fiction is World War II. If you took a close look at the history I have on my shelves you would find a lot of books that cover this time period. This book, though, was different than my normal selections. It is about a Nazi doctor before, during, and after the events of WWII. After the war has ended he has decided to write a letter to his wife about the horrors he has witnessed and participated in. It was the first time I have ever read a WWII book from this viewpoint. It was horrifying at times. I have heard countless times what it was like to live through the war, especially if you are Jewish, but this is the first time I have seen it through the eyes of the ones committing the atrocities. I really felt Skopp did an excellent job getting in the minds of his characters and show the reader the horrors of the Second World War. I especially liked watching the progression from just a regular doctor living in Germany to an SS doctor working in concentration camps. It seemed entirely believable to me. The novel follows Johann Brennar. It is after the war and he is actually writing a letter to his wife telling her what he did during the years when he did not see her at all. He thought he was doing the right thing and quickly got in over his head. Now that the war has ended, and even during it at some points, he knew he was in the wrong and feels guilty for the things that he has done. Let me tell you, there are some rather graphic descriptions of the things he did. This was the sort of book that had my jaw dropping and me rattling off what happened to the guy. Skopp does not hold back. In some moments Johann is made to seem human, but there are other times where you can't help looking upon everything as a monstrous turn of events. I am now playing over some of the scenes in my mind and am horrified all over again. As an interesting contrast the book also talks about Philipp Stein. He is Johann's friend when they are children and also becomes a doctor. He is Jewish, though. His life heads in a completely different direction than Johann's. And, things get complicated for their friendship. The story rotates between the two and includes moments when they are together. It gets more and more complicated as the word escalates and offers a fascinating two-sided view to something I have never really explored in fiction. This review has been very hard to put into words. All I can say is it is one of my favourite reads of the year and I recommend that if you get a chance you read it for yourself. And, I will point out it is something you have to talk about. I rattled on about this book the whole time I was reading it. There were moments where it was just so appalling. I knew these things happened, but to witness them through the eyes of the characters horrified me. I cannot believe that people were capable of these acts and Skopp does a good job of pointing out that at their core they were only human. So, yes, just read the book and then you will understand just how compelling it all is. Well, this is going on my list for sure! I read some non-fiction in my late teens/early 20s about the doctors and experiments, etc. Horrifying. I've never been able to go there again but this sounds like something I need to read. This is not normally the type of novel I would read, but your high praise makes me curious about it. Still I'm not sure about the graphic WWII atrocities descriptions.